The passage from childhood to adulthood, or rather, from comics to vinyl, was made smooth in the early seventies by the fact that comics and vinyl both looked very much the same, and employed the same imagery, and occasionally used the same artists. Sometimes comics (by which I mean superhero comics) and vinyl referenced each other, as when Country Joe hymned the Marvel Group with ‘Superbird’, and Stan Lee returned the compliment by having Nick Fury, Agent of Shield, assassinated at a Country Joe & The Fish outdoor gig at Madison Square Garden. 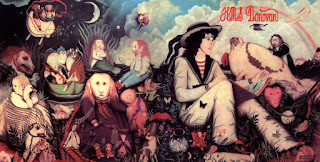 And remember Arlo Guthrie immersed in Mighty Thor on the back cover of Hobo’s Lullaby? With typical confidence and swagger, Marvel Comics briefly introduced the slogan ‘Pop Art’, whilst, at around the same time or not much later, record sleeves expanded from single sleeve to gatefold, and from three colour to multi-colour. As the sixties careened to a halt, and we entered that enjoyably messy decade, the seventies, the retentions of childhood were everywhere – sometimes referenced ironically, and sometimes nostalgically. Innocence was in short supply at this time, unless you happened to be 12, which I was in 1971 (born late '58). Artist Neal Adams was familiar from his work on The Green Lantern, the coolest superhero in the DC firmament, mainly because of Neal Adams. Ostensibly self-aggrandising, the sleeve is in fact knowing, sardonic and clear-sighted about the usefulness of counter-culture heroes as superheroes, as well as a beauty to behold. 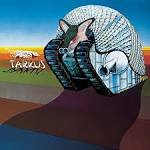 A bionic hybrid of armadillo and armoured tank, trundling around in a flat, skeleton-strewn plain, is an apt depiction of the music, which tends towards pomp and bombast. Ah, but we loved it at the time. The Who bassist had a fairly macabre imagination, and this evocation of a child’s wonderland gets less ironic the closer you look at it. I don’t know what the album is like, but the cover is classic. A poorly drawn knock-off of a poster ad for, what was it, Clark’s Pathfinder Shoes? Such wholesome associations stand in stark contrast to the music: a relentless assault on the senses on what is unquestionably the most bonkers, wayward and freakiest outpouring in the entire psychedelic canon. This is saying something, I know, but hearing is believing. The textured and preternaturally fragile sleeve is a true work of art and invokes Arabian Nights-style magic. Perfect for singular acid folk of Spirogyra (the term had not yet been coined), which manages to exude crystalline purity and anticipate wild, scabrous punk at one and the same time. Possibly the most accessible of the matchless original vinyl trio by Cockerham, Gaskins and Co. Pete Rhodes is the artist. Gatefold majesty, indebted, I’m sure, to Pauline Baynes, the genius illustrator of the Narnia books, but not actually by Pauline Baynes. Gini Barris, in fact. I could as easily have chosen In the Court of the Crimson King, a brain-fried homage to William Blake, and surely one of the most distinctive and iconic sleeves of all time. A surreal vision, rich in incident and detail. 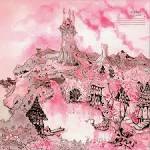 Makes a convincing case for the LP sleeve as a work of art in itself, though part of the pleasure lies in spotting the literal and imaginative allusions to the songs within. The album is a masterpiece too, incidentally. Paul Whitehead is the artist responsible. Ha! Paul Whitehead again. Indeed Paul Whitehead is to early Genesis what Neon Park is to Little Feat. This is rougher in handling than Fool’s Mate, and has the proper English morbidity, straddling the line – to an endless horizon! – between surrealism and outsider art. Whitehead designed one more Van der Graaf masterwork, Pawn Hearts, but fatigue was definitely setting in with Foxtrot. Ragamuffin is the innocence to the experience of its successor, Bump n’ Grind. 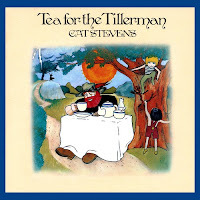 No album was so profound or sensitive as a Cat Stevens album in 1970, and no sleeve illustration was as innocently enchanting as Stevens’ own painting for Tea For the Tillerman. Roger Dean was by this time literally creating and destroying worlds, the Galactacus of rock cover art. The fairyland panorama was a popular stand-by of prog-rock, and this is one of the better examples. A tender embarrassment, which we might overlook for a mint copy. This is outside our time frame, 1968, but included because it still resonated in school playgrounds circa ’70-’73, partly due to the all conquering success of T. Rex. Too callow to comprehend the scale of Marc Bolan’s archness, we gaped in wonderment at the full title, My People Were Fair and Had Sky in Their Hair… But Now They’re Content to Wear Stars on Their Brows, and marvelled at the matching profundity of the cover art, which looks singularly cack-handed now. Something to do with Steve Hillage. Space was definitely the place in 1972, and this served well enough until I discovered Sun Ra several years later. 0 Responses to "15 Sleeves For the Child Within, circa ’70-’73*... "